George T. Morgan, the man who designed the Morgan Silver Dollar, was born in Birmingham, England in 1845. He was working as a contract engraver for the Royal Mint in London when Henry Linderman, the director of the U.S. Mint, recruited him by mail for a six-month trial as a Special Engraver for the Mint’s Philadelphia branch. (The salary was $8 a day.) Linderman was looking for a new engraver because he was less than impressed with the quality of the coinage that was being produced by the Philadelphia Mint in general… and by the father and son team of Chief Engraver William Barber and Assistant Engraver Charles Barber in particular. Morgan arrived in Philadelphia in 1876 to a warm reception from Linderman and a chilly (or even somewhat hostile) reception from the Barbers. In the beginning the Barbers refused to share their workshop with Morgan, so he worked on his designs at the rooming house where he lived. Eventually Linderman forced the Barbers to make room at the Mint for Morgan. The U.S. Congress was debating a proposed law that would require the U.S. Government to buy up between two and four million dollars worth of silver and coin it into silver coins EVERY MONTH. In anticipation of the passage of this law, Linderman asked both William Barber and George Morgan to submit possible designs for a new dollar coin. 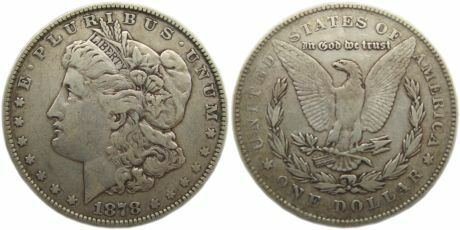 Barber designed a new Liberty Head dollar that was very popular with his colleagues, but Linderman preferred Morgan’s design, the coin that soon became known as the Morgan dollar. Linderman suggested a few changes in the design, and the coin went into production less than two weeks later. As a point of political irony, the first Morgan dollar that came out of the Mint was presented to Rutherford B. Hayes, the President who had vetoed the bill authorizing it. If Henry Linderman had remained as Mint Director he would undoubtedly have appointed Morgan as Chief Engraver when William Barber left that position in 1879, but Linderman had already retired due to ill health and the position went to Charles Barber. Morgan remained an Assistant Engraver for most of his career at the Mint and only eventually became Chief Engraver in 1917 at Charles Barber’s death. Among Morgan’s acts as Chief Engraver was to briefly revive the Morgan dollar in 1921, followed by the introduction of the Peace Dollar in 1922 as the standard silver dollar series. 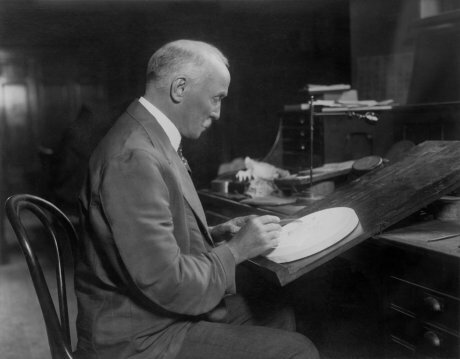 Morgan died on January 4, 1925, after less than eight years as Chief Engraver. He was active in his office until just a few days before his death. Many years after Morgan’s death, his personal sketchbook was discovered and donated to the Smithsonian Institution, where it was largely forgotten for many years. 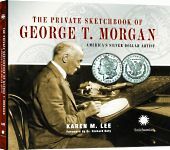 With increasing interest in the Morgan dollar after the release of many previously hoarded Morgan dollars to the public, the sketchbook (which is said to reveal Morgan’s creative process over a twenty-year period) has recently been published in book form as The Private Sketchbook of George T. Morgan, America’s Silver Dollar Artist . Included in the book are eighty pages reproduced from Morgan’s actual sketchbook. Filed under Coin Designers, Morgan Silver Dollar.